Put simply, project management is the act of planning, organizing, and managing resources to bring about the successful completion of specific project objectives. The project itself can be anything, from creating a product brochure to implementing a new hiring process to launching a new product line. What all projects have in common, however, is that they’re finite endeavors—every project has a specific start and completion date. And it’s to this latter date that you must manage. The challenge, of course, is completing the project by the assigned date—and to the agreed-upon budget. Key to this is the tight management of each and task that comprises the project; if all the component tasks are completed on time and on budget, the entire project will be completed as planned. If one or more tasks slip—and you can’t make up the lost time elsewhere—your project will come in late. To manage the individual tasks within a project requires managing a larger set of resources—people, of course, but also money, materials, space, communications, and the like. This resource management is crucial to ensuring the eventual success of a project. Project management professionals like to think in terms of juggling a certain set of constraints: scope (what must be done to produce the end result), time (the amount of time available to complete the project), and cost (the budgeted amount available for the project). These constraints are interrelated; one constraint can’t be changed without impacting the others. For example, if you increase the scope of a project, you typically need to increase the time and cost, too. If you want to reduce the time to complete the project, you might need to increase the costs (pay more to get it done faster) or reduce the scope (try to accomplish less things on a tighter schedule). These three constraints (scope, time, and cost) are often referred to as the project management triangle, with each side of the triangle representing a constraint. The key to effective project management is to use all available tools and techniques that enable the project team to organize their work to meet these constraints. And, not surprisingly, one such tool is a web-based project management application. Traditional project management software helps project managers and team members organize and track all the various tasks in a project. To do this, the software typically includes scheduling, budget management, and resource-allocation components. Web-based project management applications do all this online, with a centralized project file accessible to all team members. This enables improved communication and collaboration between members of the project team. Some of the bestselling traditional desktop projection management programs include Microsoft Project, Primavera Project Planner, and FastTrack Schedule. The scheduling component of a project management application helps the project manager schedule the series of events that comprise the total project. This should include a list of dependencies—those events that need to be completed before other events can start. The project management application should then be able to calculate the project’s critical path, which is the series of events that determine the length of the entire project. After the project has been planned, it then has to be executed. The project management application should enable this execution by creating task lists for team members, allocation schedules for project resources, overview information for the team manager, and, as the project progresses, an early warning of any risks to the project’s completion. All that said, most web-based project management applications work in a similar fashion. Let’s examine some of the most popular of these cloud services. The web-based project management program known as @task (www.attask.com) offers a variety of traditional projection management functions. 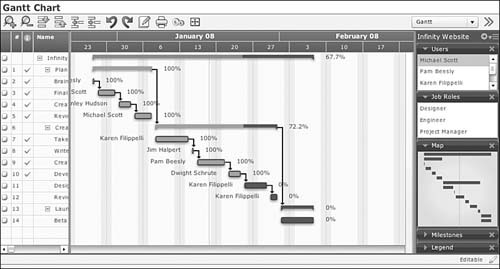 The application includes an interactive drag-and-drop Gantt chart (shown in Figure 1), critical path analysis, project milestones, planned/projected/estimated comparisons, resource scheduling, issue management, and calendar views for project tasks.  Tasks can even be managed remotely via a special software widget for Apple’s iPhone. Figure 1. The drag-and-drop Gantt chart in @task. A Gantt chart is a type of bar chart that illustrates a project schedule. Individual tasks appear as discrete bars on the chart. Dependent tasks are linked to the end of prior activities. AceProject (www.aceproject.com) is an easy-to-use web-based project management application. It lets users manage multiple projects using multiple resources and share those resources across projects. Tasks can be tracked via a variety of filters that fine-tune the results, and the application offers a number of different project reports and statistics. AceProject also offers time tracking, email notification of task deadlines, and a monthly project calendar, shown in Figure 2. The start and end dates are shown on their individual dates (in green and red, respectively). Figure 2. 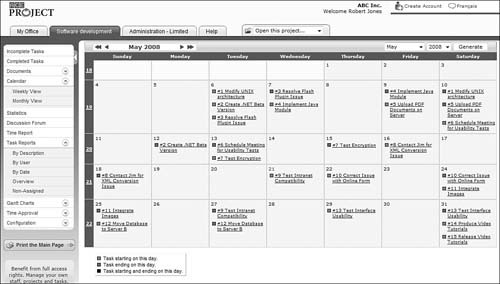 AceProject’s web-based project calendar. One of the most popular project management applications today is Basecamp (www.basecamphq.com). Its web-based nature makes it viable for both internal and external (client) projects. Project management is provided via a special dashboard, shown in Figure 3. The dashboard displays all projects and clients on a single screen, with late items and those due soon highlighted on the screen. Figure 3. Basecamp’s project management dashboard. 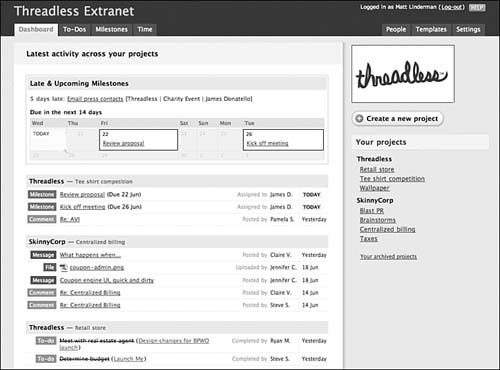 In addition to standard project management operations such as time tracking and milestones, Basecamp includes to-do lists, file sharing, message boards, wiki-like web-based documents, and other group collaboration features. All web-based pages created by the program can be fully customized. One of the aspects of Basecamp that makes it so appealing is its price. The company offers three different plans (Basic, Plus, and Max), priced from a flat $24/month to $149/month. This is in contrast to similar applications that price on a per-user basis. Basecamp’s flat pricing makes it easy for organizations of any size to pick the plan that’s right for them, based on the number of concurrent projects and storage space needed. Copper Project is a project management application that can be hosted either on the company’s servers or on your own server. Either version enables web-based collaboration. Copper includes useful features such as a drag-and-drop weekly or monthly timeline, resource management, email alerts, statistical reports, and a unique personal time management tool. The program’s Springboard view lets you see the progress of multiple projects on a single screen; you can drill down from there by client or project. 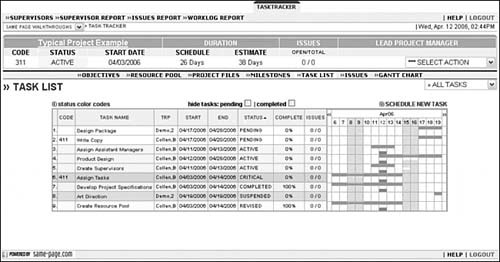 TaskTracker from eStudio (www.same-page.com/online-project-management-07.html) is an easy-to-use online project management application. This program includes features such as task lists (shown in Figure 4), work logs, issue management, automatic task dependencies, subproject capability, budget and expense tracking, Gantt charts, and a full set of management reports. Figure 4. An eStudio TaskTracker task list. Another company offering online projection management solutions is onProject (www.onproject.com). The company’s myonProject application is a subscription service that offers collaborative project management functionality. The application’s Workspace page provides one-screen access to all key operations. Other useful features include Gantt charts, time and expense tracking, issue tracking, a web-based task calendar, automatic email notifications, file sharing, group discussion forums, contact management, and full project reporting. Pricing is on a per-user basis. The Project Drive (www.project-drive.net) application includes communication and collaboration features in addition to basic project management functionality. Users get a customizable overview dashboard, templates for fast project setup, Gantt charts, task management, resource allocation, document sharing and management, automated communication tools, a group calendar, cost analysis and budgeting, and a large number of management reports. Vertabase (www.vertabase.com) is a popular web-based project management application. It offers a summary executive dashboard, multiple schedule views, project portfolio, cross-project Gantt charts, resource planning, budget control, issue tracking, and a detailed project schedule. Wrike (www.wrike.com) is a project management application that offers a unique way to create project tasks. The application is email based; emails from project members are automatically converted into tasks in the appropriate project. Wrike then automatically reminds employees about overdue tasks, creates individual schedules for employees, and generates Gantt charts for each project. Our final web-based project management application is Zoho Projects (projects.zoho.com), another popular product from the Zoho cloud combine. 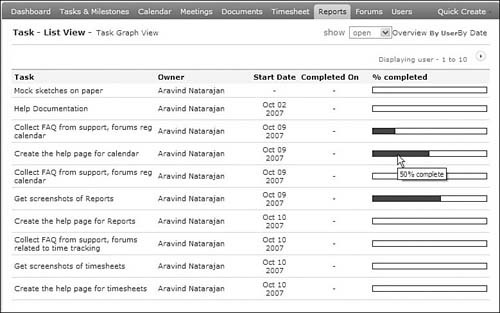 Zoho Projects is a standard project management application, complete with tasks and milestones, a project calendar, Gantt charts and other reports (including the task list view shown in Figure 5), time tracking, and group file sharing. Figure 5. View project tasks in list view with Zoho Projects. Zoho offers several different versions of the Projects application, from a single-project Free version to the Enterprise version that lets you manage an unlimited number of projects. Pricing ranges from free to a flat $80 per month. The advantages of using project management software are well known; when you have a large number of resources and constraints to juggle, it makes sense to let technology do a lot of the detail work for you. But there are even more advantages to using a web-based project management application, especially if your projects involve participants and resources that aren’t all based out of the same location. Naturally, a web-based application lets participants from different locations access the same master project files. When the master project is housed in the cloud, there are no issues with maintaining the right versions of files for all users, or with synchronizing files among computers to make sure they’re all up-to-date. Users can access files from any Internet-connected computer using any web browser. Of course, cloud project management services also let smaller companies tap into more powerful applications. A small company pays only for the resources used, and can easily scale upward if a single project grows in size or if the company needs to manage additional projects. That one-time cost of traditional software is turned into a pay-as-you-go charge. In addition, using web-based services facilitate improved communication between team members. Many web-based project management applications include email, blogs, message boards, and chat rooms for use by project members. When everything takes place on the web, it’s a lot easier for team members to talk to each other. This, in turn, facilitates group collaboration—which is what large projects are all about. The more efficiently and effectively you collaborate, the fewer glitches you’ll encounter over the course of the project. And that’s a very good thing.